The Continuum 3 in 1 has delivered Safety, Child Comfort, Easy Installation, Snap Covers, Twist a Cup, and it's the last car seat you ever have to buy. 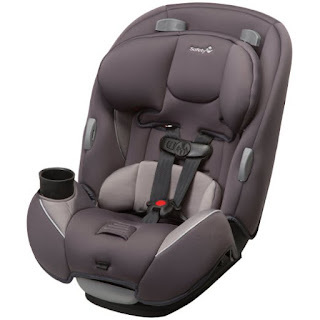 This car seat will protect baby on the ride home from the hospital, to the first day of preschool, all the way to "big kid" passengers with the booster mode. This was a replacement car seat for us and we are thrilled with the differences. Starting with the ease of installation. We had it securely in the car and ready to go in less than 15 minutes. (That includes removing the old car seat.) Of course, my granddaughter wanted to go for a ride immediately - so we did. The first thing she noticed was she was sitting a bit higher in the seat. She could see out the window "soooo much better Nana." That's great, because that annoyed her. She also like how quickly we got her clicked in and clicked out. We like it too - because it's no fun, standing in the pouring rain, trying desperately to get the car seat "clicked." We really like how simple it was to remove the cover. (It was just as easy to snap it back on.) We've only washed it 3 times, but it still looks new and fits perfectly. (We hope it continues to hold up - if that changes I will update my opinion.) The drink holder is also easy to remove and replace. It's dishwasher safe. This car seat should be the last one she rides in with Nana. Because when she's at the appropriate age and weight, (for our state) we will remove the harness and switch to the "booster mode." The booster seat can be used up to 80 pounds. And she can't wait to get the big kid seat. If you're looking for a car seat, give this one some serious consideration - we couldn't be happier with it.